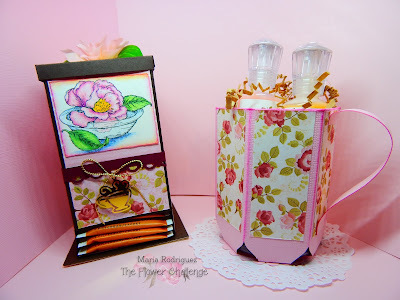 Hello everyone: The month of September brings a challenge that is a favorite for many of you over at THE FLOWER CHALLENGE and that is "ANYTHING GOES" so here are my projects and I hope you like them, I had a lot of fun creating this cute Tea Dispenser, following this fun video tutorial by HEIDI BAKS and this other fun video tutorial to create the mug by WENDY KLEIN. The videos are fun and easy to follow, this ladies give exact measurements and explain real well how to create this truly sweet projects. I wish I had some cookies or chocolates to put in the mug but I didn't have time to get any so I just filled the mug with some paper packaging and stuck a couple of Nuvo Drops bottles in there, which lets you know how roomy they are. My papers are all from a sadly retired line from Lili of the Valley, the image on the Tea Bag Dispenser is from a Power Poppy stamp set called SIMPLY CAMELLIAS, I stamped it on a piece of watercolor paper with Stazon black ink and colored it with SU markers and Prismacolor pencils. The little charm is from my stash. I hope you come and play along with us over at THE FLOWER CHALLENGE because we have two wonderful surprises for all of you. The first one is that we are welcoming a new team member to our little family, her name is MILLA and her blog's name is MUSTESORMI, she was our Guest Designer last month and we are thrilled to have her. The second surprise is that we are offering a prize for the winner which consists on a $25.00 voucher to the CAS-ual Friday Stamp Store, which Michelle kindly donated for our winner. So, come on and play along with my teammates and I over at THE FLOWER CHALLENGE, we can't wait to see what you create. Please remember to have flowers as the main focus on your card, add our banner to your blog post when you upload your card or project to the gallery and please limit your other challenge participation to 6 including ours, no back linking, only new cards/projects please. Oh how cute! They look like lots of fun to make, thanks for the inspiration! Feels like a lovely English tea party! You've been busy with the boxes again! These are certainly no ordinary boxes. Fantastically cute! Sweet gifts for the tea lovers in your life. So incredibly pretty, Maria! These are both so cute, Maria. So pretty and colorful. Both are beauties ! very creative and so lovely Maria...well done.